Monterey celebrated its Quadricentennial in 2002. Spanish merchant Sebastian Vizcaino was the first European to set foot on the Monterey Peninsula in 1602 and christened Monterey after the viceroy of New Spain, Count de Monte Rey. In March, 1776, Captain Juan Bautista de Anza arrived, shepherding 240 soldiers, settlers and their families. After changing hands a few times, Monterey eventually served as the original capital of California when the state constitution was signed here in 1849. Neon signs, billboards and hot dog stands are prohibited in the quaint village of Carmel-by-the-Sea, and a permit is required to wear high-heeled shoes. In 1960, the University of CA at Davis published a report classifying grape growing districts by climate. Monterey County was classified as Region I and II, comparable with the premium regions of Napa, Sonoma, Burgundy and Bordeaux. The Monterey Peninsula is a world-renown golf destination with 26 public and private courses. Three courses located in Pebble Beach—Spyglass, Poppy Hills and Pebble Beach itself—are consistently ranked among the top ten courses in the nation. As the #1 agricultural region in the United States, the Salinas Valley earned its nickname "Salad Bowl of the Nation," due to the wide variety of fruits and vegetables grown here. The total economic contribution of Monterey County agriculture is $8.2 billion. The Bixby Bridge in Big Sur was built by prisoners eager to earn "good time" off their prison sentences. It is one of the world&apos;s highest single-span bridges at 714 feet long by 260 feet high. In 1948, a young woman by the name of Norma Jean was crowned Castroville&apos;s first "Artichoke Queen." She later gained fame as actress Marilyn Monroe. Castroville, located on Monterey Bay, produces 85% of the nation&apos;s artichokes. The Lone Cypress tree located on 17-Mile Drive in Pebble Beach and a scenic landmark for the Peninsula, is nearly 300 years old. Cypress trees are a species native only to this region, and can live up to 4,000 years. The Monterey Bay National Marine Sanctuary covers 5,312 square miles, one and a half times the size of the largest national park in the continental U.S. At it&apos;s center, is an underwater canyon twice as deep as the Grand Canyon. Point Lobos State Reserve near Carmel hosts a geologic wonder: rocks of four "ages" can be found there, including the unusual Carmel formation dating back to the Paleocene age (over 60 million years old). In 1919, green fees at Pebble Beach were $2 for gentlemen, and $1.50 for the ladies. Rates now range from $350-$400 per 18-hole round. Although not as well known as Napa or Sonoma, the Monterey County wine region actually produces the most premium grapes in North America, spread over 40,000 acres. Carmel-by-the-Sea has one art gallery for every 34 residents. 17-Mile Drive through Pebble Beach is one of only nine private toll roads in the country, and the only one west of Mississippi. Nearly 1/4 million tons of sardines were processed on Cannery Row in 1945, the year John Steinbeck&apos;s Cannery Row was published. Built in 1844, California&apos;s First Theater in Monterey opened and is California&apos;s first (and still operating) theater. Nineteenth century melodramas have been presented here since the 1930s. Carmel is known for attracting various celebrities and artists. Clint Eastwood served as mayor of the village from 1986-1988. Other notable celebrities, artists and writers who have called Carmel home, include Doris Day, John Denver, Ansel Adams, Jack London, Robinson Jeffers, Sinclair Lewis and Upton Sinclair, among others. 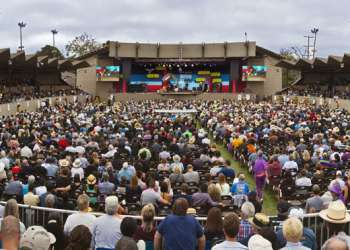 The widely acclaimed Monterey Jazz Festival occurs each September and is the longest continuously running jazz festival in the world. Past jazz greats who have appeared include Miles Davis, Stan Getz, Dizzie Gillespie and Dave Brubeck. The oldest standing public building in California is Monterey&apos;s Custom House, built during California&apos;s Mexican era in 1827. It was here that Commodore John Drake Sloat of the U.S. Navy raised an American flag in 1846 claiming California for the United States. The Monterey Bay Aquarium attracts nearly 2 million visitors each year to view the 300,000 marine plants and animals that live in this world-class aquarium. The Outer Bay Wing has a million gallon tank that depicts the open ocean, and a three story kelp forest and Deep Seas display show creatures never before brought to the surface. The National Steinbeck Center, a 37,000 square-foot facility is believed to be the largest facility devoted to a single American author. Pulitzer prize winner John Steinbeck was born in Salinas in 1902 and lived on the Monterey Peninsula for much of his life. Robert Louis Stevenson modeled Treasure Island&apos;s Spyglass Hill after Point Lobos State Reserve near Carmel. Local settings from around the Monterey Peninsula have provided the backdrop for more than 180 films, including From Here to Eternity, Basic Instinct, East of Eden, Lassie Come Home, Rebecca, Star Trek: The Voyage Home and Treasure Island.